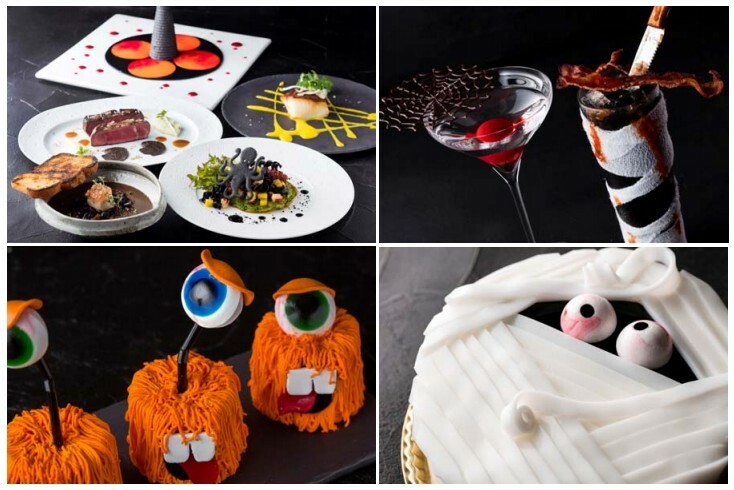 The dining floor (2F) at the Hilton Tokyo, Tsunohazu, has a few tricks and treats for you this October. There will be a black themed dinner at Metropolitan Grill from October 17-31. Sample creative dishes including black ink pasta, black angus steak, black truffle mash, and a Mont Noir dessert. It’s a 5-course dinner that includes wine, beer and soft drinks. Remember to dress in black and you might receive a Halloween treat from the chefs. 5:30pm-11pm daily. Also from October 17-31, you can try two kinds of Halloween inspired sweets by executive pastry chef David Guimaraes at Patisserie Filou. ‘Monster D’ is a chocolate cake in the form of a one-eyed monster with an orange pumpkin-flavoured pelt. ‘Mummy’ is a strawberry shortcake dessert wrapped in white jelly. 11am-10pm Monday-Friday and 10am-10pm on weekends. For the whole month of October you can also sample different Halloween cocktails at Bar & Lounge Zatta. 11am-1am Sunday-Wednesday, and 11am-3am on Thursday-Saturday. Try a ‘Bloody Martini’ with floating red jelly that drips like blood when it is pierced. Or a ‘Jack the Ripper’ if you want a novelty photo holding a bloody-bandaged glass with a knife. It’s best to book ahead, so check out the website for more details.